Sunday was another beautiful autumn day, so I headed out for some more afternoon birding at the south end of the island. This time I went to American Camp. My first great find was near the parade grounds where I found three western bluebirds. 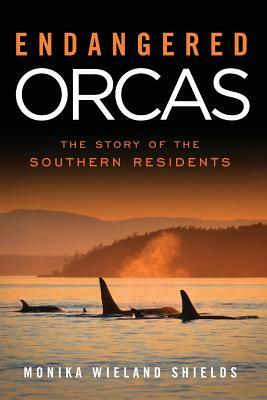 This species has been reintroduced to the island over the last five years. I got close enough to see the leg bands on one of the birds, and learned that this one was a fledgling from this year from a few miles away. The birds are probably gathering up to flock in places like American Camp before migrating away for a few months. One stretch of the trail that winds through the prairie is often pretty quite bird-wise, but not so that day. First I saw a northern shrike off in the distance, and then a single western meadowlark flew by - my first one of the winter. In a patch of brambles I also came across a mixed-species flock of sparrows. The most exciting find was two Lincoln's sparrows, but there were also song sparrows, golden-crowned sparrows, and a single fox sparrow. Down towards the water's edge the first thing that caught my eye was several big rafts of surf scoters. It was amazing to watch them all diving in unison. At times there would only be one or two dozen birds on the surface, and at other times hundreds. Closer to shore there was also a flock of 75 or so red-breasted mergansers and a few horned grebes. I was also able to spot some common and Pacific loons. As I made my way along the shoreline I found a mixed flock of black turnstones and surfbirds. They flew over towards Grandma's Cove, so I decided to go that way too to see if there was anything else to see in the cove. Was there ever! 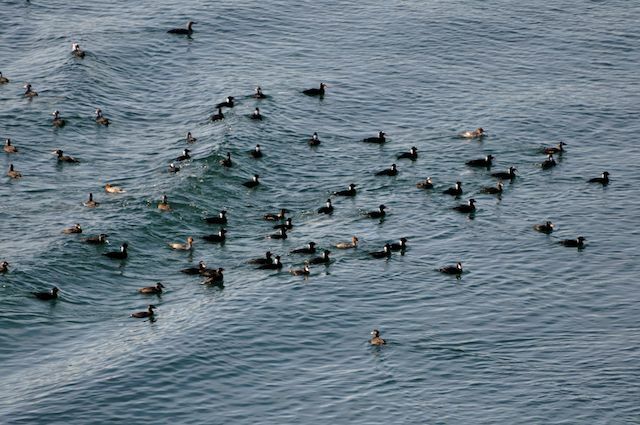 Some of the scoters had moved in, creating a huge feeding frenzy in the bay. 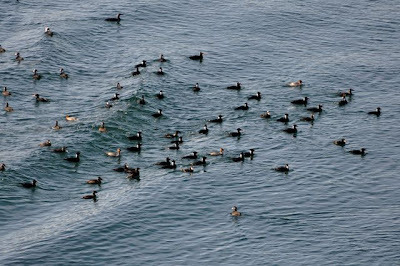 Mixed in with them were some more loons, grebes, and mergansers, plus harlequin ducks and four gull species: glaucous-winged, mew, Bonaparte's, and a few Heermann's. 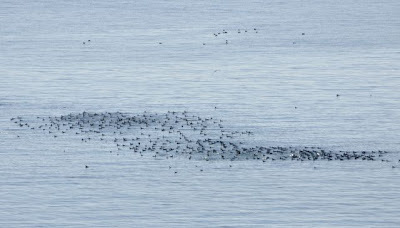 It was quite a spectacle, and I probably sat on the bluff watching them all feeding for about 20 minutes. Back on the home front there has also been lots of birding activity. The other morning I saw a Townsend's warbler out the window on the embankment - the first time I've ever seen this species from the marina. When I went out to try and get a photo it was already too far away, but an ever-bold red-breasted nuthatch landed on our new feeder just a few feet away from me. Other regular visitors have been chestnut-backed chickadees, house sparrows, dark-eyed juncos, and, unfortunately rock pigeons. The pigeons were a novel species in the spring but wore out their welcome in just a couple days. Not only do they eat a lot of seed, poop all over the deck, and scare away some of the other, smaller native birds for whom the feeders are intended, but they've started digging through the planters, uprooting plants, and throwing dirt all over the deck, too. One reason for the new feeder was to transition away from the tray feeder that they have easiest access too, but unfortunately one bird at least has figured out how to hold onto this new hanging feeder. Ah well. Great shot of the scotors and loons. 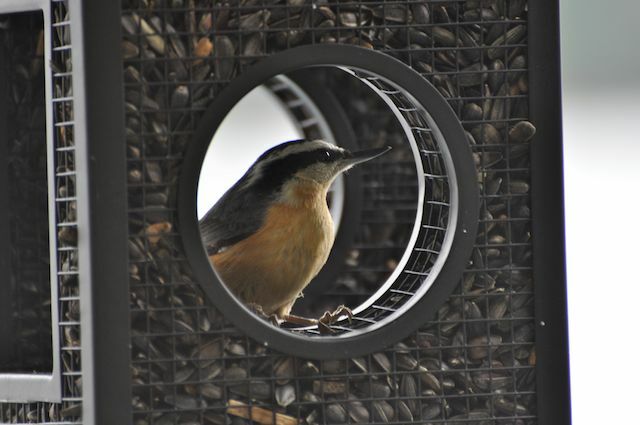 And I love the shot of the Red breasted Nuthatch. They are cuties. Hmm, that looks like an interesting feeder, too!